In a study recently accepted for publication by the Journal of Cognitive Neuroscience, scientists at UC Berkeley's Helen Wills Neuroscience Institute and the School of Public Health report that normal 9- and 10-year-olds differing only in socioeconomic status have detectable differences in the response of their prefrontal cortex, the part of the brain that is critical for problem solving and creativity. 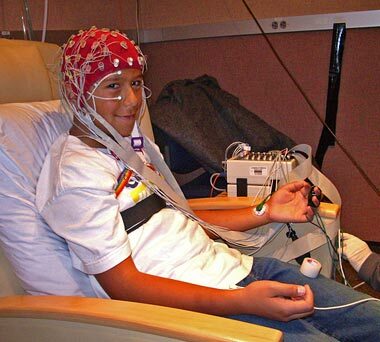 Brain function was measured by means of an electroencephalograph (EEG) - basically, a cap fitted with electrodes to measure electrical activity in the brain - like that used to assess epilepsy, sleep disorders and brain tumors. "Kids from lower socioeconomic levels show brain physiology patterns similar to someone who actually had damage in the frontal lobe as an adult," said Robert Knight, director of the institute and a UC Berkeley professor of psychology. "We found that kids are more likely to have a low response if they have low socioeconomic status, though not everyone who is poor has low frontal lobe response." While the patterns differ, I wonder how plastic these children's brains still are at this age, and whether the differences can be minimized if these children are moved / educated in a more enriching environment, and the study repeated 5 or 10 years down the road. From what I remember from neurology though, it seems that at 9 or 10 years old, their brains are pretty set, unfortunately. Studies like this will increase attention on the need for early intervention in terms of education to prevent students from falling behind (vs. the overemphasis on dropout rates in high school, a point at which it is almost too late to intervene for the majority of individuals in my opinion).